Looking to buy a fedora in New York City? Please visit us to check out our great selection. We have all sizes from extra small to extra large up to XXXL. 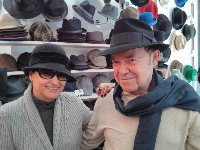 Here are some customers from last week wearing their new hats.